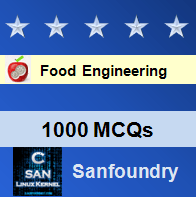 This set of Food Engineering Multiple Choice Questions & Answers (MCQs) focuses on “Principles of Food Storage Stability”. 1. Which of the following physical qualities of storage food can be tested? Explanation: Both of the mentioned physical qualities of storage food can be tested. 2. Statement 1: Certain meats like beef and pork have a tendency to break apart when handled. Statement 2: It is possible to predict the stability of food products from time-temperature data. Explanation: Certain meats like beef and pork have a tendency to break apart when handled. It is possible to predict the stability of food products from time-temperature data. 3. Relations between time and temperature to determine the stability of food products is obtained by using which of the following data? Explanation: All of the mentioned shows the relations between time and temperature to determine the stability of food products. 4. Three samples were subjected to certain treatments. Which among the following is unfit for consumption? Explanation: It is important to remove air from the storage container. Both the odor and flavor of the first container deteriorated. 5. Which among these two – vitamin retention test and sensory quality test, should be used as a basis for determining temperature or time of storage of food items which are intended as primary or important sources of thiamine or ascorbic acid? Explanation: Vitamin retention test should be used as a basis for determining temperature or time of storage of food items which are intended as primary or important sources of thiamine or ascorbic acid. This is because these vitamins decreased faster than did either their color or palatability. 6. Results and objectives of an investigation are given in one of the points. Which could the correct answer be? Explanation: All of the mentioned are important criteria to be addressed and are plausible points that might have been covered. 7. Statement 1: Seasonal and regional variations have little effect on the sensitivity of a product to damage due to temperature elevation or variation. Statement 2: Faulty processing/ packaging has a major effect in increasing the sensitivity of a product to damage. Explanation: Seasonal and regional variations have little effect on the sensitivity of a product to damage due to temperature elevation or variation. Faulty processing/ packaging has a major effect in increasing the sensitivity of a product to damage. 8. Frozen products differ markedly in their susceptibility to damage. This sentence can be accounted for by the following- Orange juice deteriorates rapidly but peas lose their quality slowly. Explanation: Frozen products differ markedly in their susceptibility to damage. This sentence can be accounted for by the following- Orange juice deteriorates rapidly but peas lose their quality slowly, both of which are frozen products. 9. Damage once done to a frozen product with respect to temperature can be undone. Explanation: Damage once done to a frozen product with respect to temperature cannot be undone. A product damaged due to an increase in temperature cannot be restored by decreasing its temperature again. 10. With respect to frozen products, a sample held for 1 week at -3 deg C will be indistinguishable from a sample of the same product at -17 deg C for a year. Explanation: With respect to frozen products, a sample held for 1 week at -3 deg C will be indistinguishable from a sample of the same product at -17 deg C for a year. Every 5 degC that the temperature is increased, the speed of quality loss increases by 2-2.5 times.